As you work in the Drawing or Camera view, some layers may be in the way or are used as references. You can hide these layers to make your work area easier and less cluttered. You can show and hide layers in the Timeline view in several different ways. ‣ In the Timeline’s Layer toolbar, click the Enable/Disable All button to show or hide all layers. You can also click the Enable All button located in the Timeline view toolbar’s extra buttons. ‣ In the Timeline’s Layer toolbar, deselect the layer’s checkbox to disable a particular layer. Select the layer’s checkbox to enable a particular layer. You can also click the Enable/Disable button located in the Timeline View toolbar’s extra buttons. When you disable a layer in the Timeline view, the corresponding column is hidden in the Xsheet view. ‣ In the Timeline’s Layer toolbar, click the Show Selection and Hide All Others button to show only the currently selected layer and disable all the other layers. You can also click the Disable All Others button located in the Timeline View toolbar’s extra buttons. 1. In the Timeline View menu, select View > Show > Show Manager. 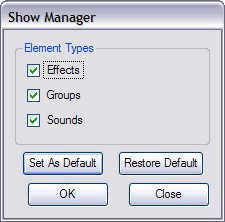 ‣ You can also select View > Show > Show Sounds, Show Effects or Show Groups to immediately show or hide the selected type. This option will remain only for the current session. Once the application is closed and reopened, the default settings will return. 2. Select the types of layers you want to display and deselect the ones you want to turn off. 3. Click Set As Default to make these new settings the default ones that will be used each time to start the application. Click Restore Default to restore the settings used when installing the application. 1. In the Xsheet View menu, select View > Column Types Manager. 2. 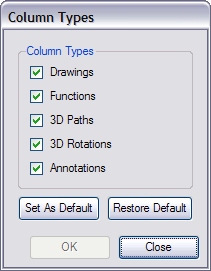 Select the types of columns you want to display and disable the ones you want to hide. 3. Click Set As Default to make these new settings the default ones that will be used each time to start he application. Click Restore Default to restore the settings used when installing the application.